The 1963 Penn basketball team reversed this course and proved that Ivy League regulations had not permanently stymied the program’s success. The other Big 5 schools competing in the annual round robin play – LaSalle, Saint Joseph’s, Temple and Villanova – were not restricted by league rules regarding scholarships or recruitment. Since its inception seven seasons earlier in 1956, Penn had never won more than two Big 5 games, winning only one game three times and twice winning no games. By finally winning the Big 5 title in 1963, Penn proved it could be successful against any opponent while still adhering to Ivy League rules. 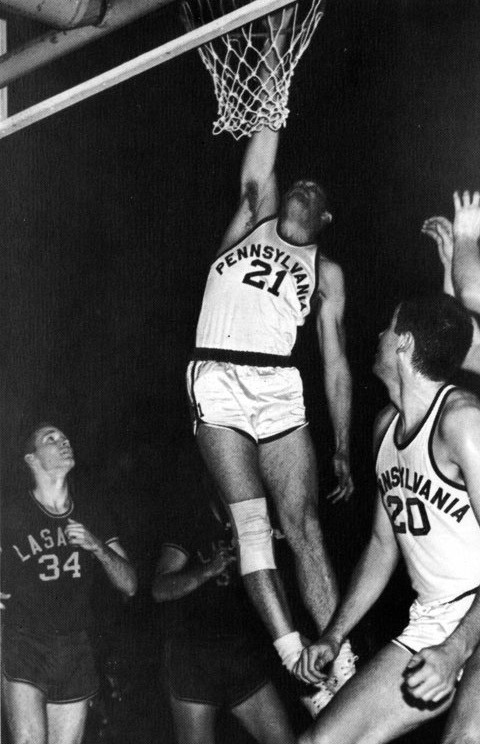 Ironically, Penn did not even win the Ivy League title in 1963, losing to a Princeton team led by sophomore Bill Bradley.1 Even though Penn lost the Ivy League title to their arch-nemesis, the Big 5 title purged Penn of any shortcomings whatsoever. As Daily Pennsylvanian columnist David Katzman explained when reviewing the 1963 year in Penn sports, “The biggest surprise was Penn’s not winning an Ivy League basketball title, but gaining a…Big Five Crown.” Penn’s Big 5 title satisfied all fans, and instantly transformed what would otherwise be an uneventful, if not disappointing season, into a season in which the University could take great pride. 1. Opponents in the Ivy League, John Wideman and Bill Bradley actually played together while studying at Oxford. There was no nearby court, so Bradley would ride on the back of Wideman’s motorcycle to a nearby US air base.